Size of Male: 50-60 lbs., 23-25 in. Size of Female: 40-50 lbs., 21-23 in. Although the Pharaoh Hound is native to Malta and has been an inhabitant of that island for hundreds of years, it’s likely that this breed actually originated elsewhere. Breed experts contend that the Pharaoh Hound is the same dog that can be seen on the tombs of ancient Egypt, dating from 3000 BC. Whatever the case, the breed today is a friendly, playful and intelligent dog. These dogs are very affectionate with their families. Powerful and graceful, they are very athletic and need lots of exercise. They also make a very good family pet. As with the other Mediterranean sighthounds, there is some uncertainty about the origin of the Pharaoh Hound. The breed strongly resembles images of sighthounds found in Egyptian tombs and in written descriptions from around 3000 BC. Breed fanciers claim that, at some point, the dogs were brought by Phoenician sailors to the island of Malta in the Mediterranean when they settled the island. They are used for rabbit hunting and are the national dog of Malta. According to the Maltese people, the dogs have been on the island for some 2000 years. They are first described as we know them today on the island in the 17th century. They were sometimes used in France and other places as hunters through the centuries. When hunting, the dog also uses its scenting abilities and has even been used to flush and retrieve birds. They have also been used to guard goats and sheep on Malta. They began to be seriously exported to other countries for breeding and showing in the mid-20th century. In many ways the Pharaoh Hound is a typical sighthound. They are affectionate in the home, playful and gentle. They usually bond closely to their family. They are noble, graceful and powerful. These dogs are alert and very fast. They need a great deal of exercise. If they don’t get enough exercise they can become destructive. They can do very well in agility, lure coursing and other dog sports that require speed and agile moves. As for dog training, the Pharaoh Hound is a very intelligent dog but he is also quite independent and tends to think for himself, as do many sighthounds. Training can require some skill on the owner’s part. You will need to make things interesting for your dog as they won’t do well if you simply try to get him to repeat things. This dog breed is also a sensitive breed so you should never be harsh with him. They may be aloof with strangers but they aren’t usually very challenging. They may bark to give a warning but they don’t usually bark very much. They are typically calm in the home. This breed generally gets along well with other dogs. However, they have a strong prey drive and they will chase and kill small animals, including household pets. Even pet cats may not be safe. It’s a good idea to thoroughly socialize these dogs from a young age with cats in order to have any hope of keeping a cat in the home. The Pharaoh Hound normally loves children. With their athleticism these dogs do need to have a yard that is well-fenced since they can easily jump a fence if it’s not high enough. Living Environment – The Pharaoh Hound can do well as an apartment dog. Like other sighthounds, these dogs are usually calm in the home and will spend most of the day sleeping if they get enough exercise. They will enjoy having a large yard if possible but be sure that it is fenced well with a tall fence since these dogs are great jumpers. They do not do well as kennel dogs since they want to be with their family. These dogs originated in a warm climate and they do not do well in cold weather, so take precautions for them in the cold. Grooming – Grooming for this dog breed is very simply. They should be brushed every few days or you can use a hound glove to smooth over them and remove any shedding hair. Bathe as necessary. Some dogs can have skin allergies, so use a gentle shampoo or one formulated for their skin to avoid problems. Diet & Exercise – Dietary needs for this breed are considered normal. However, they are a sighthound and they can be prone to bloat. It’s best to feed them 2-3 small meals per day instead of one large meal. They do require a great deal of exercise. Walks will probably not meet their exercise needs. Try to allow them to have a good daily run in a safe, enclosed area. If you allow them to run off-leash they are likely to chase small animals and they probably won’t return when you call them, so be careful where you allow them to run. Health – This is considered a relatively healthy breed. They are subject to problems with anesthesia so you should make sure your vet knows about this issue. If you are interested in this breed you should talk to a breeder about possible dog health problems. 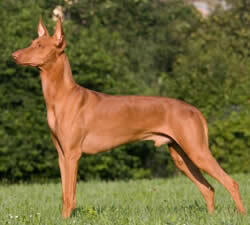 The Pharaoh Hound is a typical sighthound when it comes to dog training. They are intelligent and they may take to training, but they can also be independent and prefer to think for themselves. They don’t enjoy training that is repetitive and boring. You will need to make training more fun and interesting for them. These dogs are also sensitive, so harsh methods will never work with them. Use positive dog training techniques (praise, reward) and you should achieve good results.